VTS supports tests that require interaction between multiple Android devices. 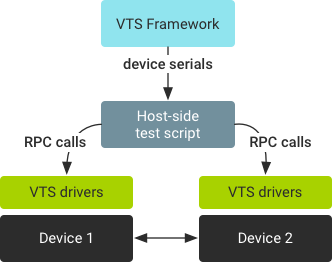 VTS uses the TradeFed framework to get and pass device serials to test modules. Figure 1. VTS passing device serials. Device requirements, such as number of devices and device types, are specified in test plan configuration. For example, you can specify a test plan that requires two Android devices with Sailfish build targets. 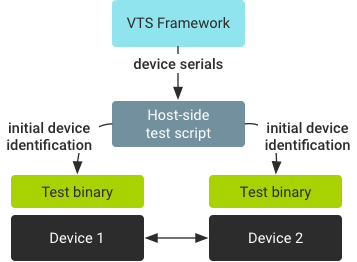 The test infrastructure (usually the test scheduler) allocates available devices that satisfy the requirements specified in test plan configuration to the VTS framework. Allocated devices are reserved for the test plan even if the test module is not using them. VTS agent binaries are then pushed to and run on all allocated devices (unless specifically instructed not to run). This ensures that TCP connections for shell commands and HAL RPCs are available for all devices in a test script. Can be specified only in test plan configuration with the required device list (future versions will allow module level configuration). Receive only one device serial. Run preparing and cleanup tasks against a specific device. Run preparing and cleanup tasks for each device or all devices. All allocated devices are reserved for the test plan, even though a test module in the plan is only using one device. Effective multi-Android tests involve communication between allocated devices. When developing such tests, you must determine how to establish communication between the allocated devices. The following sections provide three communication examples (however, test developers are free to design other models). Figure 2. Host-side HAL test. Test logic executes on the host. Host-side test script issues RPC calls to the drivers on each device. Host side coordinates device interactions. Figure 3. Host-side, agent-based test. Agent app (or binary) installs on each device. Host-side test script issues commands to apps on each device. For example, the Next Billion User tests in current VTS repo are host-side, app-based, multi-device tests. Figure 4. Target-based HIDL test. Test logic executes on devices. Host-side framework provides initial device identification. Same test binary for all devices. Different test binaries for each role. Device 1 includes a build provider and VtsDeviceInfoCollector target preparer. Device 2 includes an additional FilePusher preparer that pushes a group of host-driven related files to the device. For details and examples on test preparers, see Test Preparers. For a complete host-side multi-device example, refer to the hello_world_multi codelab.